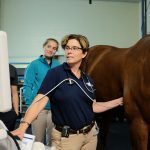 A 10-day-old crossbred filly was referred to the Internal Medicine Service at the Hospital for Large Animals at Cummings School of Veterinary Medicine, with a one-day history of sudden hind limb lameness. On her physical examination, the filly was bright and alert but had a rapid heart rate of 120 beats/minute and a fever of 103.5. She exhibited left hind limb lameness at the walk; however, no joint or limb swelling was noted. Physical examination of the left hip and sacroiliac (lower back) region elicited a painful response. 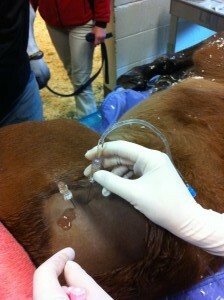 The filly’s initial blood work was within normal limits with the exception of a low IgG (antibody level) of 400 mg/dl, indicating that she had not had sufficient transfer of antibodies from her dam. Figure 1 – CT of left hip joint on day two of hospitalization. The differential diagnosis for the lameness included septic arthritis/osteomyelitis (joint or bone infection) of the left hip and trauma, such as a fracture or muscle contusion. The presence of a fever and a low IgG (poor immunity) placed an infectious process high in our suspicion as a cause for the lameness. The foal was admitted to the hospital and started on broad spectrum antibiotics (amikacin and penicillin), fluids and a plasma transfusion. Anesthesia and computed tomography (CT) were scheduled for the next morning. Computed tomography was chosen because it is much more sensitive—that is, more likely to discern abnormalities—than other modalities such as X-rays or ultrasound. Figure 2 – Three dimensional reconstruction of the CT scan on day two. The filly did well overnight but the lameness was unchanged. Bone infection (osteomyelitis) of the upper growth plate and epiphysis (rounded end) of the left femur and coxofemoral (hip) joint distension were detected on the CT. (Figure 1 and 2) While under anesthesia, a sample of the joint fluid from the left hip was taken and joint lavage (flushing with sterile fluid) was performed. The fluid obtained from the joint was cloudy in appearance, had an elevated cell count of 67,700 (normal < 200) and total protein of 4.9 g/dl (normal < 2g/dl). The cells in the fluid were primarily neutrophils (98%), which indicated infection even though no bacteria were seen and subsequent culture was negative. Figure 3 – Arthrocentesis for joint lavage of coxofemoral (hip) joint. During the filly’s initial hospital stay her joint was lavaged several times and amikacin was instilled after each lavage. (Figure 3) Unfortunately, though there was improvement initially, the cell count started to increase despite aggressive therapy. The decision was made to perform arthroscopy (minimally invasive surgical technique for imaging the joint with a small camera) for higher volume flush and joint debridement. Because of the decreased response to the initial antibiotics, the antibiotic therapy was changed to marbofloxacin (a fluoroquinolone antibiotic) and cefpodoxime (a third generation cephalosporin), which together are a very potent, broad spectrum therapy. Although fluoroquinolones carry the risk of causing cartilage damage in young animals, marbofloxacin appears to be less risky than others in this category, such as enrofloxacin (Baytril). Nonetheless, this drug is reserved only for grave situations where the risk is justifiable. Figure 4 – A CT of the left hip joint is performed six weeks after the initial scan and treatment. 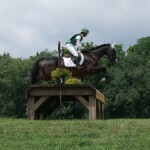 The foal was sent home for one week and brought back for a recheck joint tap in seven days. 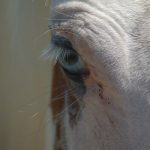 The owner was warned about possible cartilage damage secondary to the use of a fluoroquinolone antibiotic in a young animal and told to completely stall rest the foal. On the recheck joint fluid, the cell count in the synovial joint fluid had decreased significantly but was still not normal. A dose of polyglycan (a drug that contains naturally occurring components of joint fluid) was administered into the affected joint to decrease inflammation and aid in cartilage healing. An additional three-week course of antibiotic and exercise restriction was recommended. 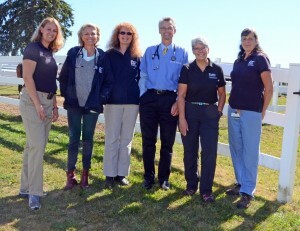 After three weeks, the foal returned to the Hospital for Large Animals for a follow up CT and joint tap. 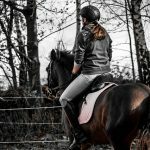 On physical examination no pain could be elicited from the left hip region and no lameness was noted. The foal had gained 46 pounds since her last visit. Marked improvement of the osteomyelitis was identified by CT with only small areas of lysis and sclerosis (remodeling) still present. (Figure 4) The total protein and cell count of the synovial fluid was also much improved at 1.6 gm/dl and 2500 cells/ul, respectively. Antibiotics and stall rest were recommended for an additional two weeks. 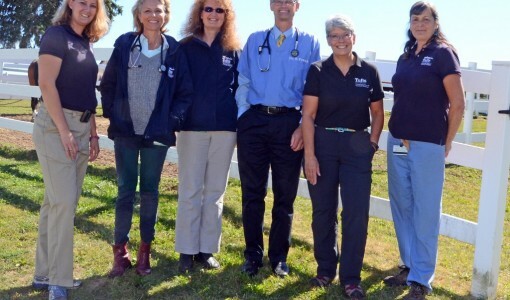 Follow-up calls to the referring veterinarian and the owner indicated that the foal was a normal two-year-old with no signs of residual lameness.